The annual Young Investigators’ Meeting (YIM) brought together exceptional young and senior scientists, heads of institutions, and representatives from funding agencies for interactions focusing on science careers, mentoring and networking. The program featured illuminating talks and panel discussions by mentors that focused on a wide variety of topics ranging from choosing the right research problem, publishing, personnel management, funding opportunities and mentorship. Senior scientists described their scientific journeys providing inspirational and amusing anecdotes about their experiences with younger scientists who are establishing their careers. YIM 2019 was held between 6-10 March 2019 at Guwahati. Read report here. The photos and the videos from the conference will be updated shortly. On November 26, 2018, one day prior to the start of the workshop, there will be an Orientation Session on Careers in Science Administration and Management with speakers from India working in related areas. This session was free and open to all. Schedule can be found here. The first level of the workshop, which is for 3 days, included up to 50 selected participants and involved in-depth discussions and assignments. About 20 of these participants will have the opportunity to attend a second, advanced level of the workshop scheduled on 10-11 January, 2019 at IISER, Pune. On 12 November, 2018, there was an Orientation Session on Careers in Science Communication/Journalism with speakers from India working in related areas. This session was free and almost 130 people attended the session. The schedule can be found here (link). The first level of the workshop began from 13- 15 November 2018, included up to 50 selected participants and involved in-depth discussions and assignments. This workshop was conducted by a team of experienced faculty from Coventry University, UK. IndiaBioscience supported the 2nd National Post Doc Symposium 2018 at CCMB, Hyderabad from 3-5 October 2018. Manjula Harikrishna presented the IndiaBioscience poster. IndiaBioscience brochures were distributed during the meeting to the attendees. The event was covered by live tweets on the social media. The poster was well received by the participants and they showed genuine interest in engaging with IndiaBioscience. IndiaBioscience could make connect with many active researchers during the course of two days. Smita Jain from IndiaBioscience spoke about career avenues for post-docs and about the importance of professional networks. The detail report on the meeting and some of the recommendations that came out can be read here. IndiaBioscience was invited to be part of the India Alliance Fellows Meeting in Delhi from 17-19 May 2018. 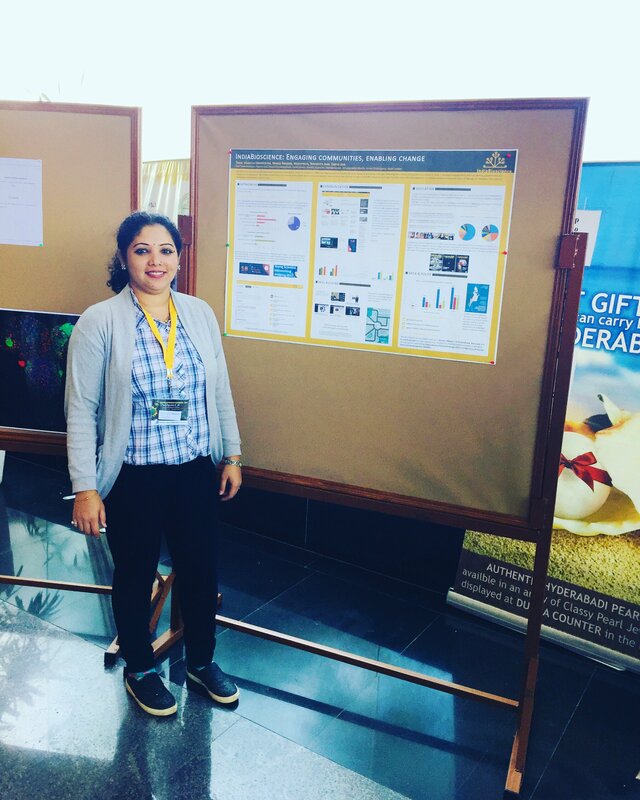 Manjula Harikrishna represented IndiaBioscience at the event and presented the work poster. The poster showcased the variety of activities that IndiaBioscience carries out. Manjula spoke to the India Alliance fellows and other participants about the five major verticals (Networking, Communication, Skill building, Education and Data & policy) under which IndiaBioscience operates. IndiaBioscience brochures were distributed during the meeting to the attendees. The event was covered by live tweets on the social media. An informal session on Careers in Science was planned for the PhD students and post docs of the School of Life Sciences at University of Hyderabad by Sharmistha Mukherjee on 27th April 2018. Smita Jain from IndiaBioscience spoke about the value of a degree in Life Science, the skill sets that one gains in the course of the journey, how these skills come handy when one enters into the professional world and the various different careers that are open in today’s era to the science graduates. It was a very interactive session where the audience had many questions to ask. YIM 2018 was held between 5-8 March 2018 at Thiruvananthapuram. Read report here. The photos of the conference can be found here. The videos from the conference can be found here. 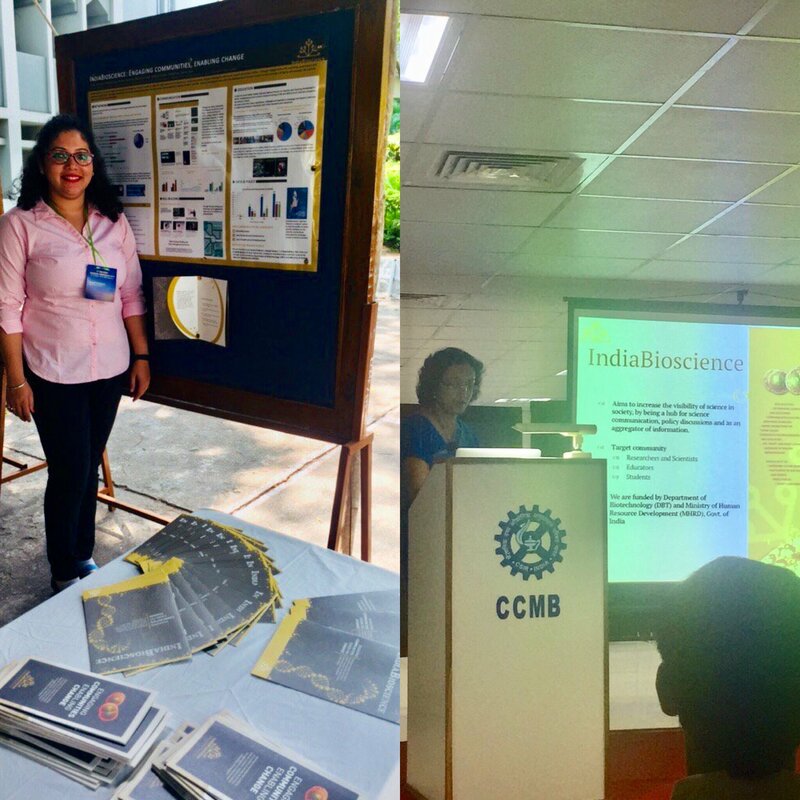 IndiaBioscience was invited to participate in the “Outreach Program-Meet the Scientists”, that was organized by the International Congress of Cell Biology 2018 as one of the outreach initiatives alongside the scientific meeting. The session was scheduled on 2nd February 2018 at Chalapathi Institute of Pharmaceutical Sciences, Guntur, Andhra Pradesh. The session started with a welcome address by Mr. Srinivas Shankar Prasad, Convener, Task Force Committee, EDB, GoAP who is also involved in the skill development program by the Andhra Pradesh Government. “Meet the Scientists” session started with an enlightening session address by Prof. Ian C. Eperon, Chair in Biochemistry, University of Leicester who spoke about his scientific successes and personal journey in a very lucid language. The second talk was by Prof. B Moorthy, Professor of Pediatrics Baylor College of Medicine, Houston who urged the students to follow the path of science not just to fulfill their scientific quest but also for the betterment of the society. The second session was focused on Careers in Science. Dr. Smita Jain, Associate Director, IndiaBioscience, in her talk, she stressed on the changing scenarios and urged the students to follow their dreams. She said that it has been a norm world over that after graduating with a degree in science, one follows the path of academic research and eventually become an independent researcher making discoveries. However, the time has come when we should start looking at the bigger picture and understand that not everyone with a “degree in science” needs to become an independent researcher. Mr. Shyam Suryanarayan, Founder and CEO, SciTal, Bangalore in his talk spoke about assessing the inner self and aligning it well with the external to find the right fit while making career choice. He also spoke about the different options available to the life science graduates in the industry. This was followed by the interaction session where students freely asked lots of questions ranging from chasing the right career to some questions related with fundamentals of Biology. Prof. N. Rama Rao, Principal, CIPS, Guntur gave the vote of thanks and expressed his gratitude to the speakers for visiting them that far and addressing the students. Click here to read an article about the workshop. Manjula Harikrishna, presented IndiaBioscience's work poster at ICCB 2018. The Poster showcased the variety of activities IndiaBioscience is engaged in. The poster depicted the five major verticals under which IndiaBioscience operates, which are, Networking, Communication, Skill building, Education and Data & policy. In each area, work done in the last few years and its impact on the scientific community was shown through the graphs and the figures. Euraxess India organised an event on 'Communicating science out of the lab’ at Anna University in Chennai on 11th of November 2017. This event gave an opportunity for the finalists of the Euraxess Science Slam India 2017 to hone their communication skills and doubled up as a workshop for participants to learn better communication skills. 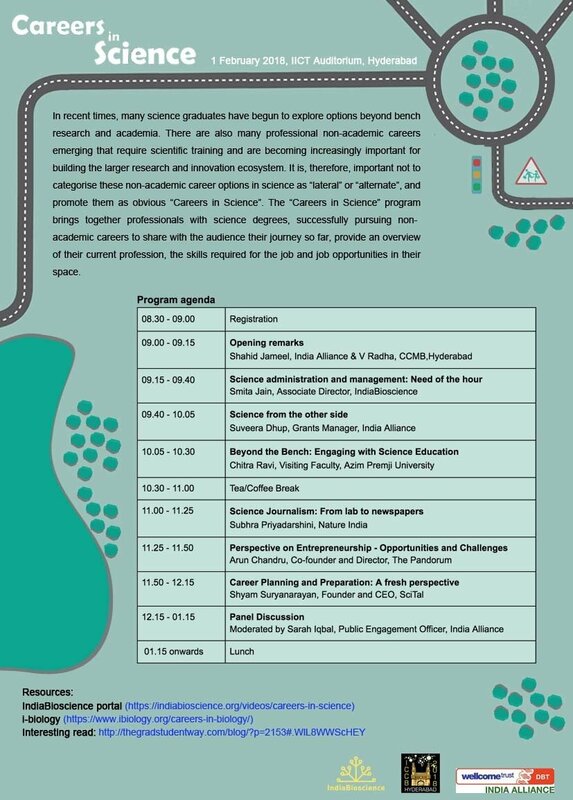 The program included talks by Ainhitze Bravo from Euraxess about educational and research opportunities in Europe, followed by Arnab Bhattacharya from TIFR, who gave spoke about chai and why, a science outreach effort he undertakes. He also gave students practical tips on presentations, posters and scientific writing. IndiaBioscience helped organise a talk by Leslee Lazar of IIT Gandhinagar- one of IBS' freelance contributors- at the Chennai event. He talked about designing visuals for communicating scientific research. The DST Centre for Policy Research (DST – CPR) organised an Open Access Week at IISc from 23rd October 2017 to 27th October 2017. The centre was joined by the student’s council at IISc, Centre for Contemporary Studies, JRD Tata Library and IndiaBioscience in organising the event. A quiz competition, a poster competition and a panel discussion were organised as part of the week-long activity.The panel discussion focussed on Institutional policies to promote open access. A detailed report on the panel discussion can be found on the IndiaBioscience website, here. The postdoctoral office is a part of the Office of Intramural Training and Education at the National Institutes of Health, USA, that has a large population of postdoctoral fellows (about 3500). 60% of these fellows are from other countries. Many of them are in the process of making important career decisions and are looking for positions in biomedical research all over the globe. Though India is an attractive destination for biomedical research, most of the NIH postdocs appear to be unaware about the plethora of options available here. To fill this need gap, the Office of Intramural Training and Education at the National Institutes of Health, USA with the help of IndiaBioscience organised a webinar that highlighted India as a place to seek opportunities in biomedical research. The webinar saw enthusiastic participation from the postdoc community at NIH 29 postdocs attended the event in person and approximately 29 joined from all over the US via internet. Nitin Gupta, who is an associate professor at Indian Institute of Technology, Kanpur and an NIH alumnus, spoke to the audience about his career trajectory and journey back home in India from NIH. He spoke about the how one needs to plan the move back and what it takes to settle down and start being productive. He also gave a vivid picture of things that are easy in India and the challenges that exist here. LS Shashidhara from IISER Pune, spoke about Science, Technology and Innovation in 21st century in India. He emphasized that now is the right time to be back in India to address the numerous challenges that the Indian society is facing – this will not only give the researchers a niche problem to work on but will also benefit the society at large in the long run. He also spoke about the various schemes, funding opportunities and programs being run by Government of India that are helpful for researchers and educators. The question and answer session towards the end saw numerous queries that were answered by LS Shashidhara and Nitin Gupta. IndiaBioscience attended Science Administration and Management Workshop for Women in Science 2017-18 from 18-21 Sep, 2017 at IISER, Pune. The whole objective of the workshop is to generate avenues to retain trained woman power in Science. Smita Jain from IndiaBioscience was part of panel discussion on Synergy among Academia, Admin & Grants for working in science: roles and challenges on 18 Sep, 2017. Click here for more information. IndiaBioscience organised "Careers in Science" workshop in association with Biological Science Department, IISc on 8 September, 2017. This workshop created an awareness about the various career options available to Masters and PhD level students in biological sciences. A life in academia has always been thought of as the obvious choice for science graduates. IndiaBiosciece was not only instrumental in arranging this line up of speakers but also took care of the other organizational details. Through this workshop, we brought students face-to-face with people who have successfully carved a niche for themselves outside of academia. The workshop generated a lot of positive feedback from the participating students. The detailed report on the workshop can be found here. Pictures from the event can be found here. “Ramalingaswami Re-entry Fellowship” a re-entry scheme of the Department of Biotechnology (DBT), Ministry of Science & Technology, Government of India aims to attract highly skilled researchers (Indian nationals) working overseas in various cutting edge disciplines of biotechnology, by providing them an attractive avenue to pursue their R&D interests in Indian institutions. This is a senior fellowship programme. As part of a regular evaluation on their performance, a bi-annual conclave is organised in different parts of the country. The 7th Conclave of Ramalingaswami Fellows was hosted by Institute of Bio-resources and Sustainable Development (IBSD) at Imphal, Manipur from 28th-31st August 2017. This was the first time that this conclave was organized in any North-eastern state. It was attended by about 200 fellows who presented their work. Smita Jain from IndiaBioscience was invited to deliver a talk about the IndiaBioscience program to bring awareness among the fellows and to showcase how fellows can utilize the website and the network of IndiaBioscience for their benefit. There was ample opportunity to network with the fellows and IndiaBioscience program was much appreciated by most many. IndiaBioscience set up a stall at the Biennial Meeting of the Indian Society for Developmental Biologists at IISER, Pune between 24-27 June 2017. Reeteka Sud and Manjula Harikrishna represented IndiaBioscience at the meeting. It was a great opportunity for us to interact with the participants and the members of InSDB. There were almost 245 people present for the meeting. The interaction helped us understand the needs of scientific community and share with them ways of engaging with our platform. We were able to show to the participants the various news articles, grants, events and jobs listed on our website. The meeting helped us create a buzz about our website among the audience. Hopefully, this will help us take IndiaBioscience to more people. IndiaBioscience is co-organising the Young Scientist Networking Meeting (YSN) 2017 between 24 - 25 April 2017 in CRG Barcelona, Spain. The meeting schedule and a list of speakers can be found here. YIM 2017 was held between 6-10 March 2017 at Goa. Read interviews with organisers, participants and mentors. Watch this space for updates about photos and videos from the Meeting. IndiaBioscience conducted a science communication workshop "Communicating science through popular media" in the second edition of Tangled Bank, a symposium organised by the students of NCBS’ Ecology and Evolution labs. IndiaBioscience was a co-organiser of the fourth Tibetan Science Conclave held in Bangalore from 15-17 December 2016. Our team conducted workshops on Grant Writing and Science Communication, and arranged visits for the participating students at IISc and TDU, Bangalore. IndiaBioscience conducted a Science Communication Workshop at the annual Ravi Sankaran Inlaks Fellows Meet 2016 on 20 September 2016 at the National Centre for Biological Sciences, Bangalore. The second Young Investigators Meeting in the United Kingdom (YIM-UK), will be held on 16 September 2016. Co-organised with YIM UK, Cambridge. The third event in the Wikithon series was held at CES, IISc, Bangalore on 16 July 2016. Read more about this event in The New Indian Express, The Hindu (here and here), and one of our participant's blog. This event also sparked a debate on Wikipedia Signpost about whether or not Wikipedia itself is biased in its criteria for adding more entries on women. YIM 2016 was held between 27 February - 3 March 2016 in Delhi. Read interviews with recruiters, young faculty and postdocs at the Meeting focussing on faculty hiring. See photos from the event and watch videos of mentor talks. We participated in the meeting, interacting with Fellows and informing them about IndiaBioscience. IndiaBioscience participated in the DBT-Prakash Lab foldscope workshops between 16-21 December 2015 at Delhi, Guwahati and Kaziranga. Read the blogs here. IndiaBioscience had a stall at the MCB 75 meeting at IISc between 11-14 December 2015. A discussion of scientific, social and political issues concerning career development of women from early stages to top level management positions through keynote speeches and a panel discussion on 23 November, 2015 jointly organised with Max Planck Society, Alexander von Humboldt Foundation and DWIH (German House for Research and Innovation, New Delhi). Find more details about the event here. Illustrating methods for writing successful international research proposals, between 21-22 November at Bangalore. Co-organised with the Max Planck Society (MPG) and Freie Universität Berlin India offices. Know more here. A virtual wikithon to add and edit pages of Indian Women Scientists. The WellcomeTrust/DBT India Alliance and IndiaBioscience organised a booth at the NIH Research Fair, USA, between 17-18 September 2015. The first Young Investigators Meeting in the United Kingdom, between 5-9 September 2015. Co-organised with YIM UK, Cambridge. Read more here. A session on Opportunities in Indian research on 7 September 2015, and a stall between 6-8 September 2015 at the EMBO meeting, Birmingham, UK. Details here. YIM 2015 was organised between March 27- April 1 2015, in Gulmarg, Jammu and Kashmir. Find details , live blogs (Days 1, 2, 3, 4 and 5) and videos. Between 17-20 December, IndiaBioscience conducted workshops and campus visits for Tibetan Science students of the conclave, organised by the Tibetan Scientific Society. We organised a discussion session on opportunities in Indian academia at ASCB 2014, between 5-10 December, 2014 at Philadephia, USA. Find details here. 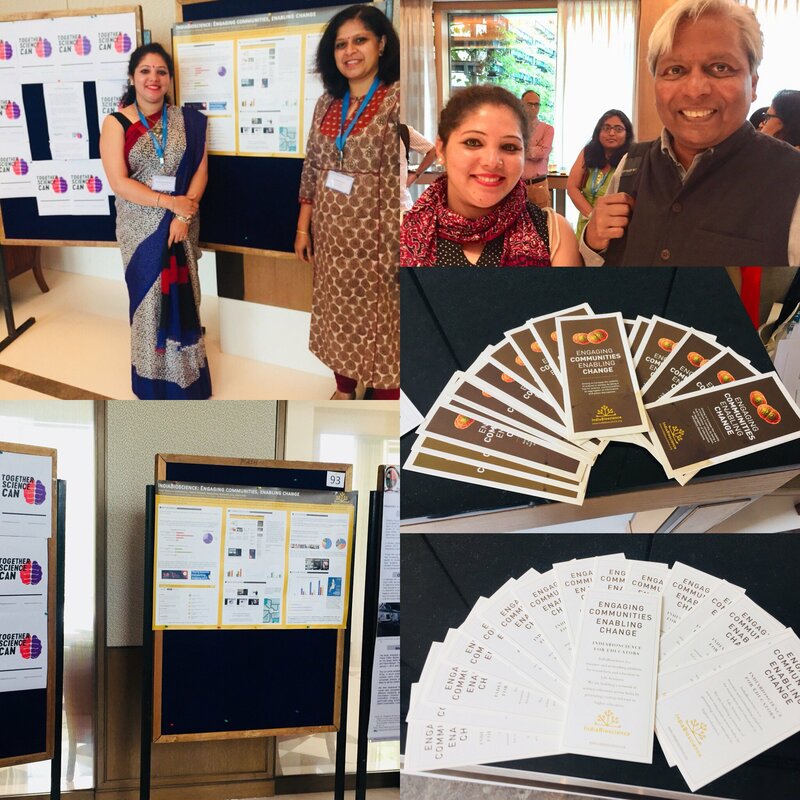 Increasing student awareness through a booth and session on funding opportunities at the NGBT 2014 conference, between 17-19 November 2014, Bangalore. We interacted with students and postdocs about opportunities and professional development at the IISc career fair Samanway between 17-18 October 2014 through a booth and a talk. The first edition of a series of events to raise the profile of women scientists on one of the most-popular online encyclopaedias - Wikipedia. 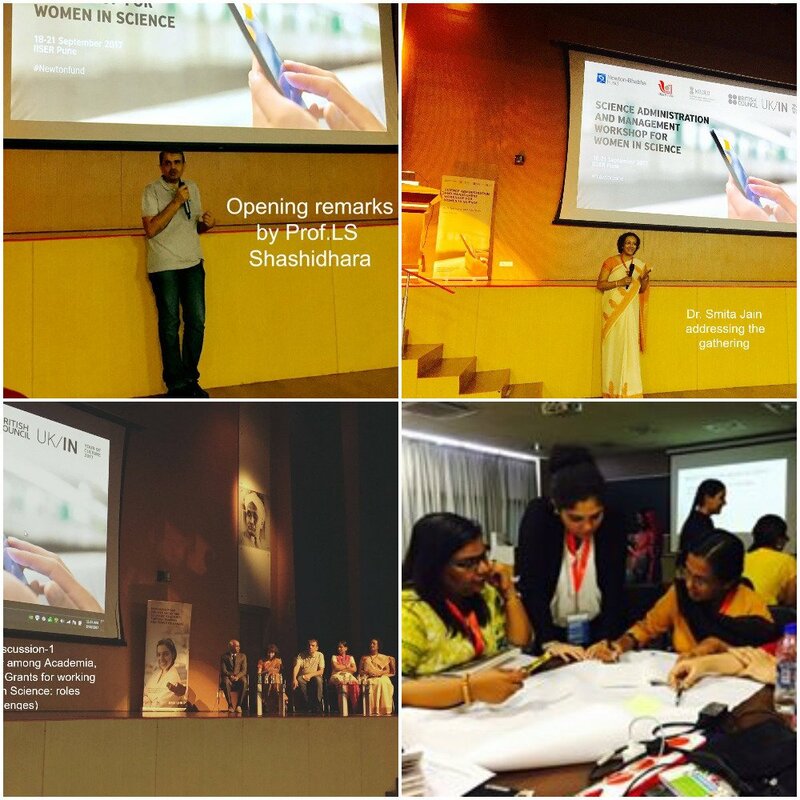 Participants created and completed profiles of Indian Women in Science on 11 and 14 October 2014. Find more details about the series here.